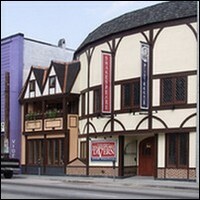 The Shakespeare Tavern Playhouse is not like other theatres. It is a place out of time - a place of live music, hand-crafted period costumes and outrageous sword fights, with the entire experience centered on the passion and poetry of the spoken word. With an authentic British Pub and a broad selection of Irish ales and premium brews, the Shakespeare Tavern is a place to eat, drink and nourish the soul. Parking: Parking is available in the Emory University Hospital Midtown Parking Deck, located directly across the street from The Tavern on Peachtree Street. Do not park on Pine Street, in the empty parking lots on Pine Street, or at the meters in front of the Tavern. Handicapped parking is available at the back of the theater, off Renaissance Parkway. MARTA: Take the Red/Gold Line to the Civic Center station. Exit the station and walk north. Turn right onto Pine Street and walk a half block east to Peachtree Street. Cross Peachtree Street and continue north (to the left). The Shakespeare Tavern will be ahead on the right.